The Silver Marten rabbits, though often raised for showing, also make very loveable and charming pet bunnies! 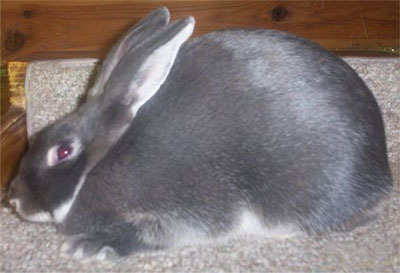 The Silver Marten rabbit is a very hardy medium sized rabbit. They grow to be between 6 1/2 to 8 1/2 pounds and have an elegant grace. Their most striking characteristic is their beautiful soft fur. The coat of an adult has a polished look with beautifully appointed markings. The Black Silver Marten, which is the most common color seen at shows, has a wonderful contrast between its polished black coat and the silver white markings of its ears and underbelly. These bunnies make great pets, though they may be a bit more timid than some of the large breed rabbits. They are playful and love to romp around. They also like toys that they can toss about in their cage. At five weeks old, the Silver Marten babies shown on the right have fur that is soft and fuzzy. They have big ears too, that seem to be almost as big as their bodies! Background: The Silver Marten rabbits were developed in the United States as an offshoot from the Chinchilla rabbit in the mid 1920's. The Chinchilla breeders were reporting "strange little black rabbits" in their litters. These little black rabbits were the start of a trial breeding program that developed into the Silver Martens that we see today. Description: These guys are considered to be a medium breed rabbit, so they do grow up to be fair sized. They will weigh between 6.5 to 8.5 lbs. when full grown. These rabbits are primarily raised for showing, though they also make good pets. The fur on the Silver Marten is one of its most striking features with a beautiful polished look to it. Silver Martens display an elegant graceful beauty because of their impressive colorations and markings. Color differences: Color varieties include black, blue, chocolate, or sable; with silver-tipped guard hairs and silver white markings to the eyes, mouth, chin and under parts. The Black Silver Martens are the most common at shows and have a stunning contrast between their black and silver white fur. These rabbits make great pets, I have had my guy now for 12 years. He has fathered many cute bunnies in his life, 54 to be exact. He was the first rabbit I had and I got him when I was only 3, I was the second owner but the first owner did not know how old he was when i got him. He is quite old now but i still love him and he has never had one thing wrong with him in his life, the only vet visits are his yearly check-ups. I know that he is not long for this world now but his legacy will live on in me and in his children. Are these rabbits supposed to be large in size? I have one and she is rather big.... ive tried everything and she just stays the same size! These are pretty good sized rabbits, and reaching up to about 8 1/2 pounds is normal. I have a Silver Martin who is about 2 years old now. Her name is Angie and she is such a sweetheart. When I first got her she bit me, but I didn't mind. Now she's an angel. We let her out of her cage and she hops out and hops on the couch to watch tv. I don't know what I would do without my angle. She was named after my aunt who died, so I know she's an angel. She also like SNOW! Believe it or not she loves it. She doesn't really like my other rabbit, thumper. They fight so they have to have different cages. But anyways, they are wonderful. I am haveing the same problem! I just got my rabbit in the middle of the summer and she doesnt seem to like to be held. is that normal? She has bit my mom like 2 times because my mom was trying to get her out of the cage. How do I get her to come to me more and be easy to deal with? I have a silver marten called Lightning. He is my first rabbit and is so sweet. I let him out every morning and evening in our back garden and he runs around. When he has enough he just comes back to me and 'asks' me to let him back into his hutch. He is also really friendly and LOVES people. When I entered him in a pet fashion show he went straight to the judges and sat right next to them!